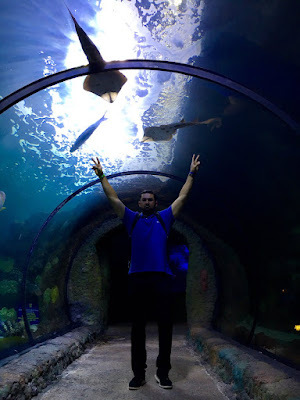 Before the start of the misery that was yesterdays ballgame, Dodgers slugging first baseman Adrian Gonzalez spent the early afternoon enjoying the beauty and majesty of Denver's Downtown Aquarium, as evidenced by a pic he tweeted out. "Overall I thought I pitched pretty well," said Maeda. "That one pitch, a slider, was definitely a mistake pitch. I always want to pitch longer, but that one pitch led to the team losing. It was very regrettable." Frankly, it was a five run seventh inning by Colorado ruined it all. "It got away from us," said Roberts. "I liked the matchup with Grant and we got a scoreless inning there. And this park, if you keep it close, you have a chance, but it just didn't go our way tonight." Today in Dodger History: In 1952 former Dodger infielder Arky Vaughn dies in a fishing accident. He drowned in a lake near Eagleville, CA when his boat capsized. In 1953 Roy Campanella tied a NL record for RBI's by a catcher at 122. He would finish the year with a Major League best 142 RBI's for a catcher. Via Ken Gurnick at MLB.com; "Simulated game could lead to Kershaw's return." "We're encouraged. We'll see what happens after that," Roberts said Monday of the Kershaw plans. "It depends how he comes out of it tomorrow." Chris Long at SoCal Autograph Odysses shares some pics from the Corey Seager's signing on Saturday. Go here to check it out. Via the Oklahoma City Dodgers at MiLB.com; "Rob Segedin Named to All-PCL Team." Via Jerome Pugmire at The Associated Press; "Frank McCourt, former Dodgers owner, buys soccer club Marseille." Via Taylor Bloom at Sports Illustrated; "LA Dodgers announce next five companies in their accelerator program." Via Lindsey Foltin at FoxSports; "Yasiel Puig took on first base coaching duties at Triple-A." Via ESPN; "Yasiel Puig: Minors humbling, but 'difficult' to see Dodgers in 1st place." "I keep hitting. I'm behaving. I'm doing the work I have to do," Puig said. "What I did wrong before and I have been doing better the last two or three weeks that I've been here. [Being called up] does not depend on me. All I can do is try to improve what I did wrong, the things that got me sent me here. The rest does not depend on me, that's [a decision for] the GM, the president. Only God knows where I will end up." Puig said that adapting to the rules of a major league clubhouse since his breakout season in 2013 contributed to his struggles both on and off the field. "It is the same rules whether [you're] in Cuba or in the U.S.," Puig said. "If you don't train, if you don't respect your coaches, whether you are amateur or professional, you will have the same problems." The Dodgers’ No. 1 prospect at midseason had a huge night, continuing a strong finish to the season. Bellinger went 4-for-4 with two homers and six RBIs, giving him 22 homers on the year. Bellinger has an uncomplicated swing and does a better job of connecting his elbow, hips and legs to drive the ball. In addition to the power increase, Bellinger is having more efficient at-bats.